Bring a historic feel to your garden with the Anthony Stoneware Bottle Bird House. The shape of this home is based on bird houses discovered in early excavations at colonial Williamsburg. The bird abodes there were placed near kitchen gardens for insect control. This home will easily house birds in your garden. The 1.625" diameter opening has three loops gracing the top of it, with two arms swirling downward for interest. The hollow body offers plenty of room for a bird family, and the soft blue glaze adds a rustic feel. Use the included screw to mount this home to a wall. This home is handmade from ceramic and then fired to 2400° Fahrenheit, to create a durable vitreous product that will withstand the rigors of time. The item will not decay, fade, or break down after exposure to UV light, for a long lasting unit. 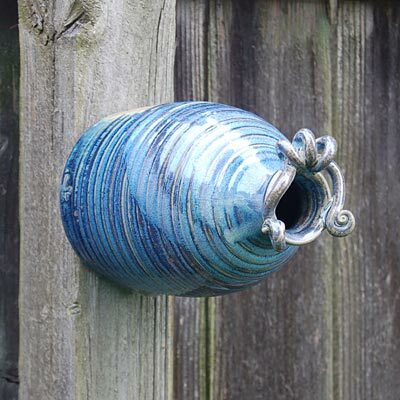 Place the Bottle Bird House in your garden for an inviting bird roost. Made in the USA.